Parnell Community Library manager Laura Caygill writes about the successful school holiday movie-making programme her staff ran and the smash-hit movie night they hosted as a result. It’s 6pm on a Friday night in July. Normally the team at Parnell Library are tidying the shelves and making sure everything’s ready for tomorrow’s patrons. But tonight they’re setting up armchairs, checking equipment and preparing the library for a night of movies, pizza and celebrating the creativity of local kids. 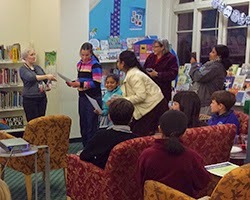 Parnell Library’s Mini Prasad came up with the idea when thinking of ways to promote the LIANZA Children’s Book Awards. Her idea was this: kids could use iPads to make trailers for their favourite finalists in the awards and we, the library, could screen them before playing a movie. With Hell Pizza generously sponsoring the awards, it seemed a no-brainer. However, we knew that we couldn’t just play a movie without asking for permission first – that would breach copyright. We found out that it was actually relatively easy to get a licence from Roadshow Entertainment (who have a great catalogue of films) for a small fee. We got in touch and found the process really easy, thanks to the excellent team at Roadshow, who were excited to have us on board. Once the licence was sorted and we had confirmed the free pizza (huge thanks to the team at Hell Pizza Quay Street for helping us out), all we had to do was to teach ourselves how to make book trailers. Mini took on the role of movie director extraordinaire, finding her way around iMovie and helping the kids make their book trailers. We chose to focus on the finalists in the young adult category of the awards. We were absolutely thrilled with the result – the kids had a ball working on their trailers through the holidays and when it came time to screen the trailers on movie night, there was laughs and applause all round. A prize pack of finalists' books and vouchers was donated by Paper Plus Parnell, and all the kids who worked on a trailer received a certificate. When we dimmed the lights and pressed play on The Hunger Games: Catching Fire, some parents stayed with their kids to watch the movie and some were happy to leave them with us for a couple of hours and pop back later in the evening. Trying something new can often be scary but, in this instance, giving it a go was well worth the effort. Since our screening we’ve had enquiries from all over Auckland asking us how we did it. But our most ringing endorsement was from Sindhu who, along with her sister Sai and her friend Amy, won the best trailer prize for Dear Vincent. Thank you for choosing us. It was sooooo much fun! I skipped my music class [to come] and enjoyed the pizzas, trailers and the movie Hunger Games: Catching Fire. It was so amazing. We couldn't have done it without your help and your assistance. Thank you for such a great [effort] from you and your library team. I think I know everyone's name in library now because of the time we visited in the library. I am so looking forward to the lip synced battle! Thanks for everything! See you soon!